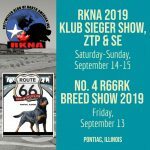 What we offer › Rottweiler Klub of North America Inc.
What we offer for the Rottweiler Enthusiast. ADRK style conformation shows with judges licensed with ADRK, FCI, and RKNA Inc.
ADRK BSE Certificates when evaluated by ADRK judges. IPO Trials for the Rottweiler with IPO judges licensed with ADRK, DVG America, RKNA Inc.
Other activities to ensure the development and maintenance of the Rottweiler as a working breed. Elite Champion which is recognized by the ADRK, this title will allow RKNA members to enter the Championship class at the ADRK Klub Sieger. RKNA also offers awards for the Working Rottweiler with our Merit and Versatility awards, we have an IPO3 club to showcase the Rottweilers who have achieved this level. Certified Health Awards for members who obtain Health Clearances on their Rottweilers. In 2018 the RKNA developed a Board elected position of Breed Warden, our program is geared toward educating and encouraging RKNA members and supporters to obtain health clearances on the dogs used in sport performance, breeding programs and to buy from breeders who do. The Standard Evaluation offered by the RKNA is an important part of our breed program, as it evaluates the Rottweiler’s conformation, temperament, and soundness. RKNA Inc. events are sanctioned and approved by RKNA Inc..
RKNA Inc. is a proud member of the ADRK World Family.